Gain insight into America’s colonial history on this small-group walking tour of Philadelphia, founded in the 17th century by William Penn as a haven for persecuted Quakers. Visit Powel House, which entertained guests like John Adams and Benjamin Franklin; St Peter’s Church, where the Founding Fathers worshipped; and Independence Hall, the original home of the Liberty Bell. Your guide will tell you about the events and ideologies that set the stage for the American Revolution, the Declaration of Independence and the Continental Congress. Meet at a central Philadelphia location and follow your guide on a 3-hour walking tour. You’ll visit several historic houses, monuments and churches dating back to the 18th century, all of which played a role in the founding of the US. Learn about William Penn, who founded Philadelphia in the 17th century as a safe haven for persecuted Quakers. Make your way to the Society Hill neighborhood to visit Powel House. Built in 1765, this elegant Georgian brick mansion was bought by Samuel Powel, who served as the last mayor of Philadelphia under British rule. Hear how he frequently entertained guests like John Adams and Benjamin Franklin. Continue to the Old City neighborhood to visit Christ Church, the first Protestant Episcopal church in the US and the birthplace of the American Episcopal Church. Stop by St Peter’s Church, a historic church that opened in 1761 and served as the place of worship for many of the US Founding Fathers during the period of the Continental Congress. Learn how the building was designated a National Historic Landmark in 1996. 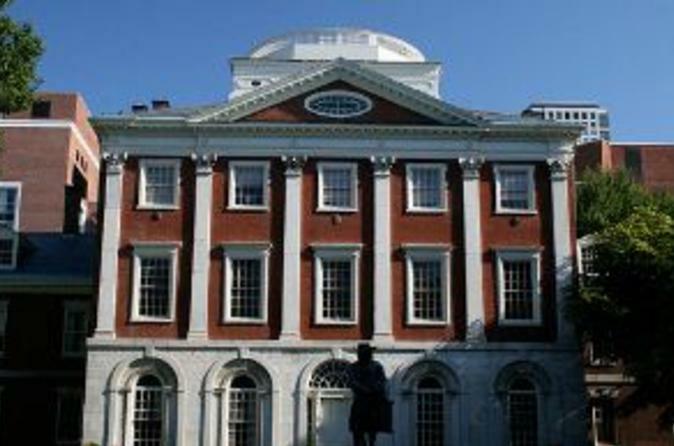 Explore Independence Hall, the original home of the Liberty Bell which now houses the Centennial Bell. As you walk, your guide will explain how the city evolved during these times, and discuss the events and ideologies that set the stage for the American Revolution and beyond.